Short on words today but wanted to share this new nail color I discovered the other day.. For all I know it's been around a long time, but I just found it last week... Its from the Sally Hanson line, yes I like her line and it's called "Cement" it's this awesome grey color. Oh yes I have a favorite! 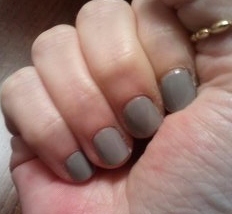 I use OPI's Smokin Havana. Gorgeous brick red sorta color. I can't wear reds because my skin is so white and it shows all the flaws. But this color is amazing and lasts forever. I don't get manicures, but you are right - a girl deserves one now and then. I am having some surgery next month and when done and I can get around, I will have one!